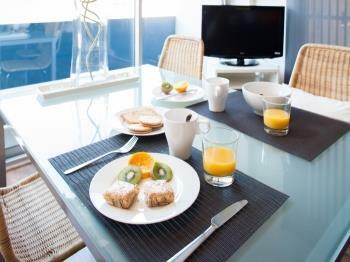 The Poblenou Beach 2 bedroom apartment (HUTB-003697) is situated in the Poblenou neighborhood. 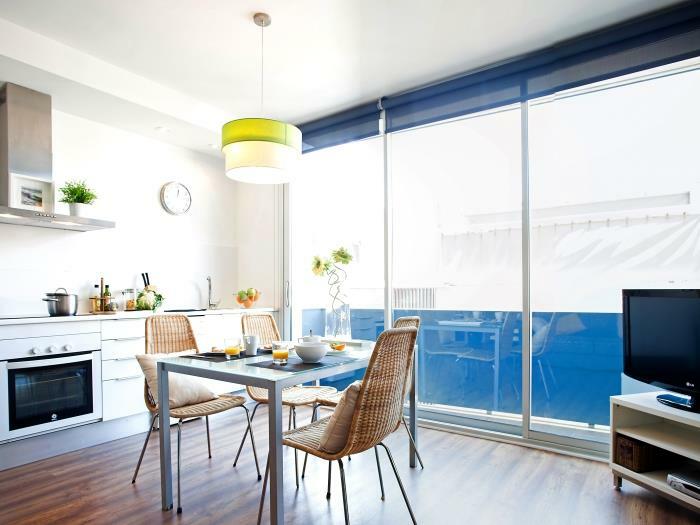 In this Poblenou Beach apartment there are two bedrooms both of which plenty of natural light and large wardrobes. One of the bedrooms has a double bed, the second bedroom comes with single bed with a second bed that folds out from underneath. The large open plan living/dining room features a comfortable double sofa bed, so the apartment offers accommodation for up to 6 people. The living and dining area comes with a TV and a DVD player. 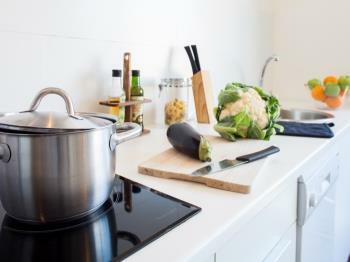 The fully equipped kitchen forms part of the same space. 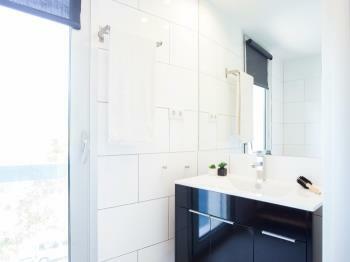 The bathroom is modern and spacious, and features a large shower. This apartment also features free WiFi and an indoor private parking in the same building (necessary to book beforehand at a cost of 15€ / day). 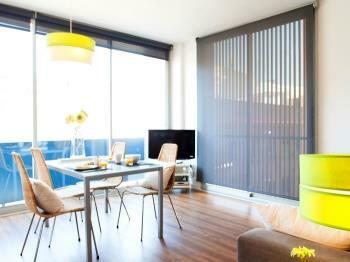 IMPORTANT: We offer other one and two bedroom apartments in the same building. 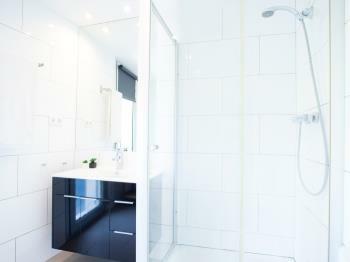 Nice two bedroom apartment in a newly built building with lift. The living room has a fully equipped kitchen and dining room in the same space, making it a very practical and dynamic area. There is a sofa bed, a SAT TV and a DVD. 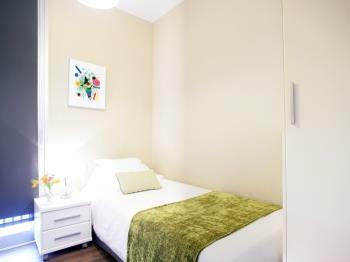 The double room has a very comfortable double bed and a closet where you can organize your belongings. The second bedroom has two single beds. 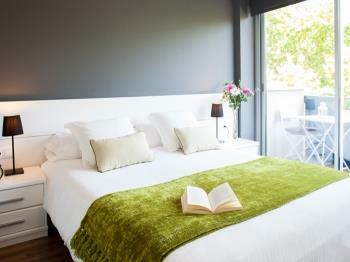 All rooms have natural light and large windows. 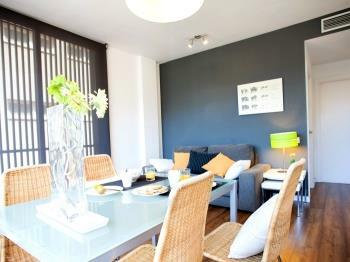 In the building there is a communal terrace equipped for your enjoyment. 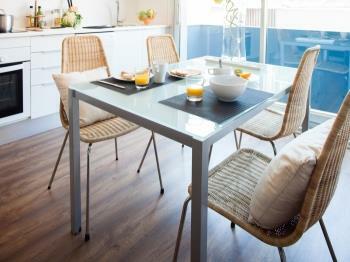 During your stay, in the same building you can meet the guests of the other apartments. Please respect their rest by limiting the noise at night. In the building there is an elevator. Parking (surcharge). Upon your arrival, we will explain the operation of the facilities and once we give you access to the apartment, you will have total privacy. We have the central office right next to the apartment, so you can come whenever you want if you need help with something. The best of the neighborhood is its atmosphere, where the visitors coexist with the local residents. The exceptional location of the apartment will allow you to be in 5 minutes on the beach of MarBella or in the rambla of Poblenou, where there are well-known restaurants, cafes and other shops. From the apartment, by metro you will reach the historic center of Barcelona in 15 minutes directly with the L4 - yellow line that you can take from Poblenou. Another way to move easy and very used in the neighborhood during the time of good weather is the bicycle. You can rent one for hours or days. If you come to a congress in the CCIB or in the neighborhood of 22 @, this apartment is ideal. A pleasant 20 minute walk by the sea will take you to the CCIB and by taxi will be 5 minutes. Check-in after 21:00 is subject to a surcharge of EUR 30. 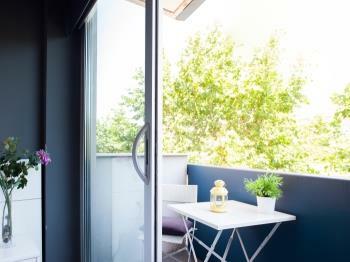 The apartment (HUTB-003697) is located in a newly built building with elevator in the Poblenou district, a few meters from the beaches of Barcelona, ​​the modern 22 @ technological district and the CCIB (Center de Convencions Internacional de Barcelona) . It has easy access by public transport to the historic center of the city in just 10 minutes. 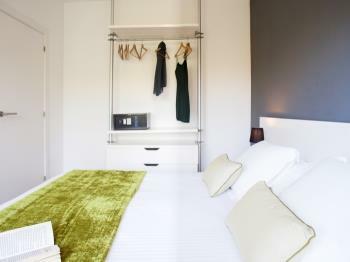 The apartment is decorated in a modern yet practical style. All the rooms have abundant natural light thanks to the large windows and the two balconies of the floor, so that it conveys a pleasant sensation of comfort and luminosity. The apartment has two bedrooms: the master bedroom is equipped with a double bed and a balcony overlooking a large garden area. 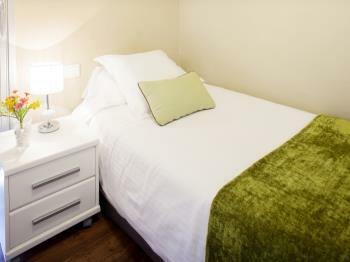 The second bedroom is equipped with a single bed that has another single bed in the bottom, so that there is the possibility of placing two single beds in the same room. The living / dining room is a spacious and bright, also has a small balcony. The kitchen is integrated in the same space and is fully equipped. In addition, in the living room there is a sofa that can be converted into a double bed, so the apartment has a maximum capacity of 6 people. Finally, the building has a communal terrace at the top of the building and private parking (attention, it is necessary to book in advance - price of € 15 / day).